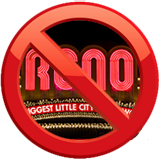 Gamblogger: Who Would Turn Down a Trip to Reno?! Who Would Turn Down a Trip to Reno?! Over the Father’s Day weekend earlier this month, Red Stag Casino, ran a contest awarding a $1500 holiday in Reno, Nevada. Players earned raffle tickets just by playing any of the casino’s more than 150 games from Wager Gaming (WGS). The prize package included luxury hotel accommodation and a show on the Strip. Red Stag Casino features slots and table games from Wager Gaming (WGS). This is not a prize package that I'd be able to turn down, myself, but the raffle winner, Bobby T., did just that. He chose to take the cash instead of the tickets and spend time with his son rather than go on a junket to Reno. At Red Stag Casino, every player gets VIP treatment and receives rewards for playing on their desktop or laptop computer or their smartphone or tablet. The casino’s motto is “the drinks are on us” referring to its six VIP bonus levels and cash back bonuses all named after popular drinks and cocktails. New players qualify for the initial Beer Club VIP level and can claim a 25% casino bonus up to $250 per day.